Applications are open for Entrepreneurs’ Organization’s Global Student Entrepreneur Awards 2018. 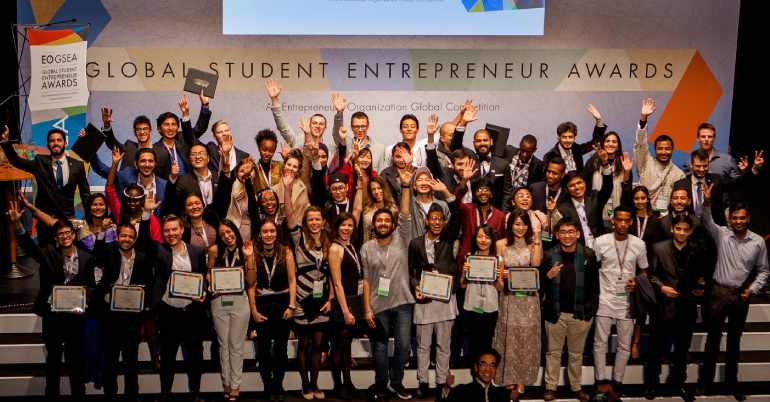 The Global Student Entrepreneur Awards (GSEA) is the premier global competition for student entrepreneurs who actively run a business. EO GSEA nominees compete in qualifying competitions for the chance to advance to the Global Finals, held in April 2018 in Toronto, Canada. With more than 2,000 competitors from more than and 56 countries, EO GSEA is an exclusive opportunity for student entrepreneurs to make connections, find resources, and grow their businesses! The local chapters of the Entrepreneurs’ Organization (EO) will host live competitions at the local and/or national level, which will serve as a qualifying event for GSEA Finals in Toronto, Canada, 14-17 April 2018. Prizes are generally a combination of cash and business services, and will vary by location. At the Global Finals, students compete for a prize package of US$20,000 in cash and a total value of over $40,000, which includes a travel/lodging expense paid trip to compete in GSEA Finals in Toronto, Canada. You should not have been one of the top six finalists from any previous year’s GSEA Global Finals Competition. The age cap for participation is 35 years of age.